The third night in Salzburg, we had our third dinner in a beer hall that served locally brewed beer. Do you sense a trend? (Spoiler alert: we had dinner in a beer garden the following night, too.) Ironically, we did not have the Zipfer beer and opted instead to try the Bernstein beer from Kaltenhauser brewery. It wasn’t until the following day that I made the connection that “bernstein” is German for “amber” and this was an amber beer, but there you have it. 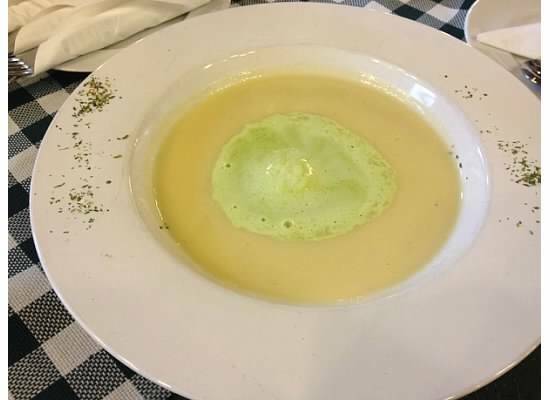 I started with a bowl of spargelcremesuppe that was topped with a blob of bärlauch creme. I think the creme was creme fraiche (or something similar) with bärlauch added to it. Assuming I can find bärlauch in Virginia, this would be a very easy dish for me to recreate because I’ve already found a good spargelcremesuppe recipe. I’ve already written about how I enjoy faschierte laibchen and have posted the recipe that I use, so I was interested in trying the vegetable version. It did not disappoint. Fried vegetables served with tartar sauce are very popular here (my favorite is fried mushrooms), but I hate frying food at home. My husband says that we’ll get a deep fryer when we return to Virginia and that will hopefully cut down on the smell and splattered oil all over the stovetop. In the meantime, I will work on learning a good tartar sauce. 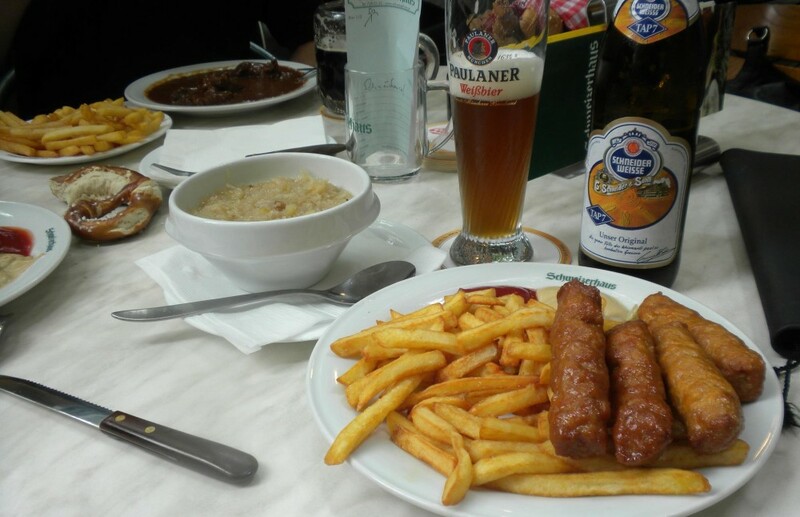 My laibchen didn’t look as good as the ones in restaurants, but they tasted good. 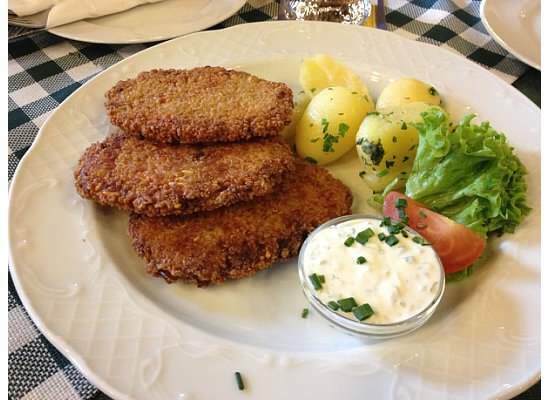 Laibchen are fried mixed-meat patties. 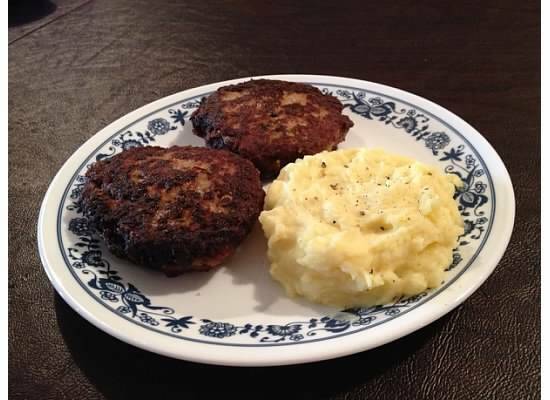 The first time I had them they were served with Erdäpfelpüree (creamy mashed potatoes), so that is how I will always serve them. 1. Grind the stale roll into crumbs. Finely chop the onions and fry until golden brown. 4. Drain on paper towels and serve immediately. 1. I could not find a package labeled “soup seasoning” so I ground half a beef bouillon cube and used it. 2. The patties I made were about 4″ in diameter and 3/4″ thick, and the recipe yielded five patties of this size. You can really make the patties any size you want, though. 3. Exact cooking time depends on the size of the patties. Mine took 10-15 minutes of frying on each side before they were done.